My first TRR (The Romance Reviews) contest! 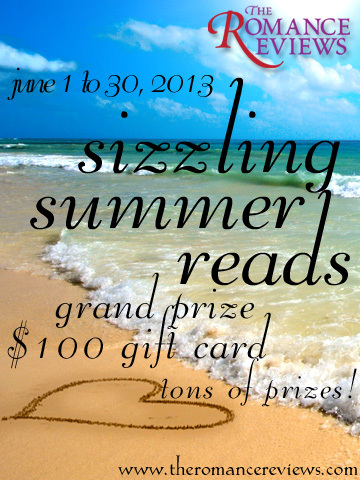 The Sizzling Summer Reads Party starts on June 1 at 12:00am EST. TRR has more than 400 participating authors and publishers, and is giving more than 400 prizes during the whole month of June. Grand prize is a $100 Gift Certificate! My book, Roar of Revenge, will be displayed on the center of the Party Event Page from June 1 to 5. So, just for kicks, look it up. My particular teaser question will appear on June 9, from 12:00am EST to 11:59pm EST. Every time you participate in a question, you earn a chance to win a prize. You must register at TRR to be able to play the game. That’s so they can keep track of your points and your points help to win you prizes. Registration is free and easy. Once you connect to http://www.theromancereviews.com/event.php, you’ll see a moving arrow pointing to an underlined label, “Sizzling Summer Reads.” Click on that label. That brings up information on the contest and you can read about the event there. The column is very long because it includes all the 400 participating authors’ names as well as the contest information. At the bottom of the column, you will see how to register/log in. Very simple. So help me celebrate this new level of author participation and marketing. Yes, the whole idea behind this—and most—contest(s) is marketing. Selling that product. So, if you haven’t checked out my book, Roar of Revenge, yet, go to TRR’s website and find it—June 1st. Try it. You’ll like it!